All I had to do was wedge the bulbs firmly between some beach rocks I had around and make sure they always had some water, but not more than an inch. I did an early watercolor sketch before they bloomed–see Everyday Art, January 10. This time I used oil pastels and gesso on black paper, making the petals with a stamp I carved into a wine cork. 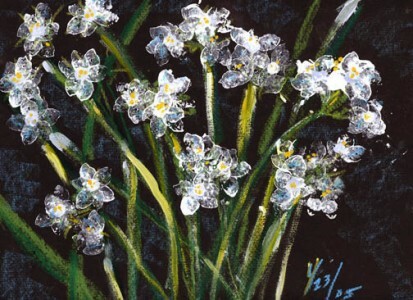 The real paperwhites are far more abundant than this simple sketch, but I get the feeling anyway.